Features front princess seams, side slits, and a heat transfer logo on the left sleeve. For storage - 3 roomy pockets: 2 front angled patch pockets and 1 inner pocket on the right. Fabric content is 54/40/6 poly/recycled poly/spandex. Approximate length for medium is 27.5". 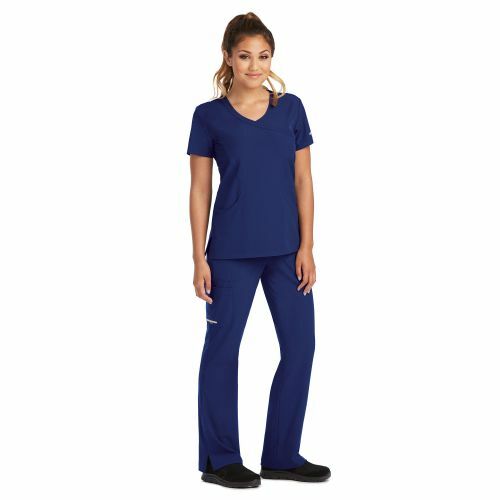 The Skechers Reliance SK102 Mock Wrap Scrub Top features front princess seams, side slits, and heat transfer logo on the left sleeve. For storage - 3 pockets: 2 front angled patch pockets and 1 inner pocket on the right.